A benefit to me of rehearsing and performing in the choir for Bach’s St. John Passion some time ago was that it focused my attention on the detail of the Passion narratives. Who, for instance, was the young man, mentioned in Mark, who fled naked from the garden at Gethsemane? There are many and various explanations, but no firm answer. I thought I might try to find an art work about him, of whatever style or period, but I can find nothing. 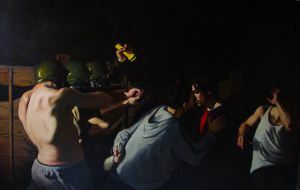 While searching, my attention was grabbed by this picture, “Judas’s Kiss”, by contemporary artist Paul Silak. I was going to say to say that I find the picture “arresting”, but perhaps I shouldn’t.